we’ve dealt with the effects of a tension-filled election period with kids emulating their parents and what they see in the media. we’ve dealt with numerous class changes with students being added and then moved to meet their individual graduation requirements. students who are not on grade level- yet have the daunting task of taking high stakes testing in less than 6 months. societal issues of poverty, racism, sexism, classism, etc. that show up in our classroom by the way of innocent children. All in all, we’re depleted. Since October we’ve been running on fumes and we’re literally “sputtering” to the finish line of Thanksgiving Break so we can refuel for the end of the year. I call this time of year, Survival Mode, and if you go into any school you can simply look at a teacher and empathize that their struggle is REAL. However, how can teachers maintain everything they have to do and still show up to work ready to give kids what they so desperately need? While not revolutionary, it’s simple- teachers, schools, and districts need to have an intense focus on The Whole Teacher Movement. 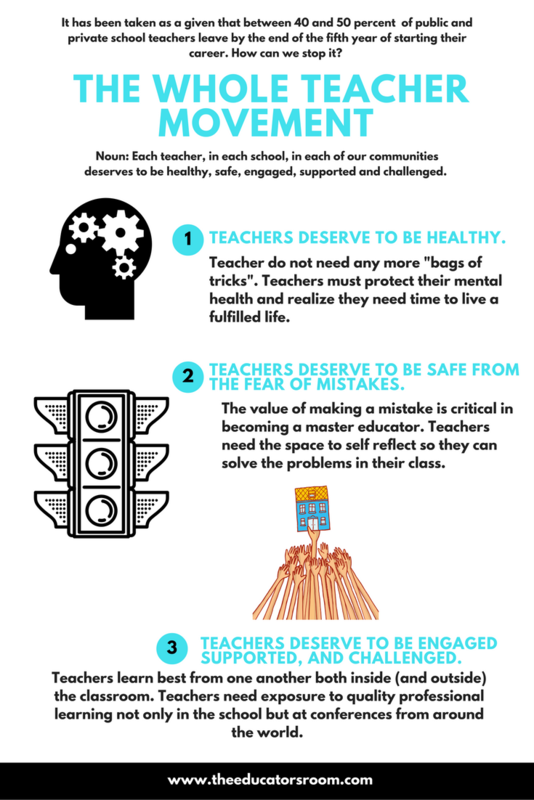 The Whole Teacher Movement deals with the belief that each teacher, in each school, in each of our communities deserves to be healthy, safe, engaged, supported and challenged. While simple, it’s a revolutionary way to not only engage teachers but to make sure teachers want to stay in the profession. According to the report, The High Cost of Teacher Turnover , close to 50 percent of newcomers leave the profession during their first five years of teaching. As you can see- The Whole Teaching Movement has to happen now. But how do you get school districts to stop and understand that this movement is critical? How do you get them to understand that teachers are not only running on fumes, but are considering leaving because they have nothing more to give. It starts with understanding what a valuable asset teachers are with not just educating our children but to threads of our society. From there here are some ways for schools to embrace this Whole Teacher Movement before they find themselves with a staff ready to leave at any movement. Address teacher’s mental/emotional health throughout the year by programs that address mental health. Understand that teacher’s jobs are difficult and staff schools appropriately. Have teacher’s “backs” when things are brought to the administration that have more to do with pride than a teacher’s teaching ability. Advocate for policies state-wide that protect teachers and their livelihoods in the classroom. Require teachers be at the “decision-making” table when policies/programs are being brought to the district. Understand that teachers personal days are theirs and they should not be shamed for wanting a day off. Address bullying concerns from teachers immediately and as swiftly as we do with bullying concerns with students. Pay your teachers a living wage. Hold the families in your districts accountable to their student’s education. Always say “thank you” for what your teachers do in the classroom. As we continue to write about addressing The Whole Teacher, we’re curious to know what do you need for your school district to address the needs of their teachers?